The excitement of wearing something you bought ages and ages ago but weren’t able to wear straight away (wedding dresses, winter coats bought in the summer sale, etc.) is unbelievable. Before Christmas I posted pictures of me finally wearing my vintage maxi skirt, and today it’s the turn of my vintage Irish wool cape. It was destiny, I tell you: the two of us were meant to be together. I visited Exeter’s best vintage clothing store during a warm spell over three months ago – the first time in absolutely ages – and saw this beautiful cape with attached scarf for only twenty quid. Twenty quid?!! I did wonder what on earth was wrong with it because why would it still be sitting there in the shop at that price… Turned out it had come in that very morning the lady said, so my little Irish beauty decided to turn up a couple of hours before I got there and just wait patiently for me. Destiny, I tell you, destiny. Christmas Day/Boxing Day outfits to follow soon! Wow!! I´ve just found a similar white cape in my aunt´s wardrobe! I am delighted with it, but now much more, after seeing your outfit! that my friend is destiny!! And a gorgeous destiny at that! im still on the hunt for the perfect vintage cape. but this beauty is perfection, and even more so at 20 quid! Such a chic and cozy outfit. 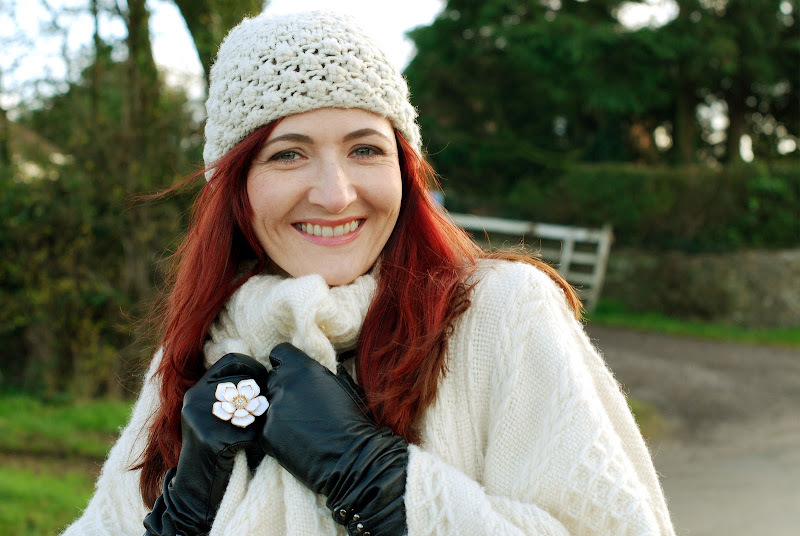 Love your poses and the idea of wearing a ring over the gloves. And yes, definitely tired of holiday food. I need a week straight of raw veggies or something to detox. Heh. I love it! I have a weakness for poncho's and capes and wear them often. You look beautiful like a little snow princess! 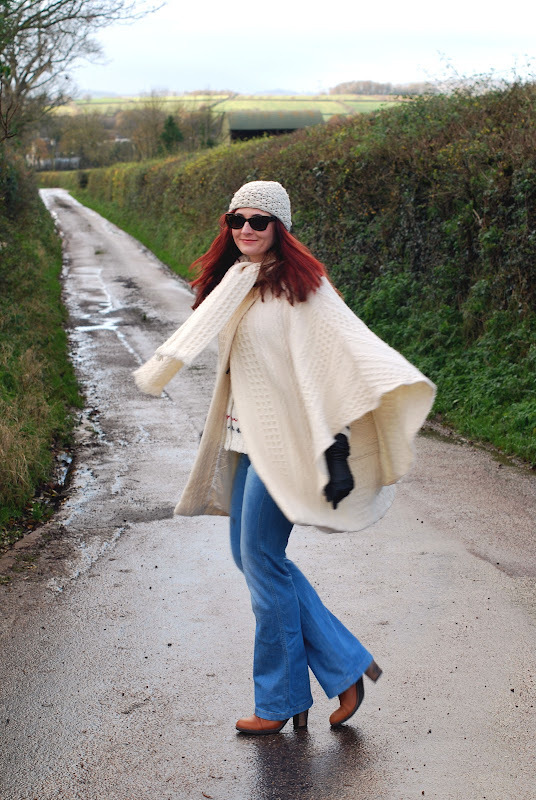 What a fabulous cape- you look so cosy! Such a lovely cape – I adore its colour and form. And it looks so good on you with those jeans. I'm sure you are super warm and comfortable in this ensemble. Happy holidays. That cape is awesome – I love its lines and the proportions are perfect on you. 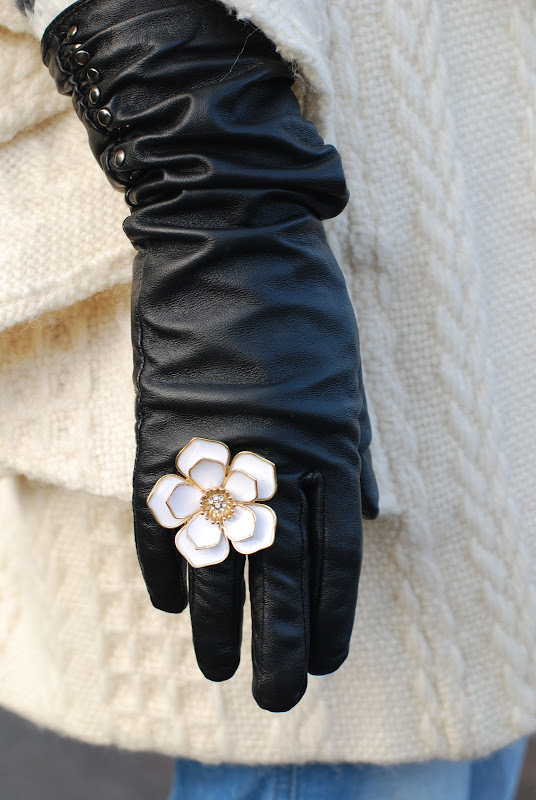 You look so pretty in this winter white and the ring on top of the glove is the perfect touch!! Hi!1 I like your blog so much!! Have a look on mine!! Completely adore your cape. Majorly fab!